Gleniff Horseshoe. Photo by RK. Sligo City Hotel. 3* hotel with very good location. You can book it here. Eala Bhán. Great restaurant at the river Caravogue. Their starter called "Taste of the Sea" is delicious. Hargadon Bros. Pub serving best Irish lamb stew and fresh fish and chips. Lyons Café. This is a bakery and cafe where you can‘t ignore the scent of fresh scones. O‘Hehirs Bakery. Another bakery where you can get some take away as well. Thomas Connolly. Oldest Irish pub along the Wild Atlantic Way. It hosts live music performances. Shoot the Crows. Pub with slightly scary interior that also features live "trad" bands. The grave of W.B. Yeats is located in the cemetery of Drumcliffe Church. The Irish poet had spent his childhood in Sligo. Although the Glencar Waterfall is very popular we recommend not to miss the Gleniff Horseshoe. It is a somehow mystical experience. At the Mullaghmore Head you can let the sea wind blow you away and watch local beach life. If you want to cross the border to Northern Ireland, you can take the bus towards Enniskillen. 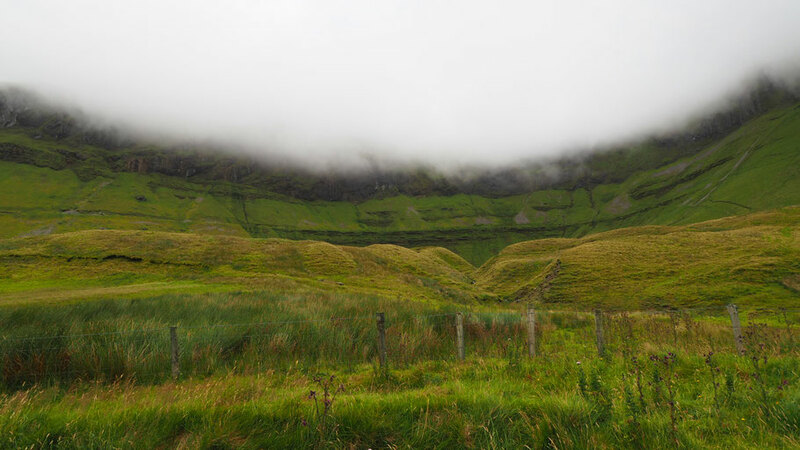 The 1.5hr ride runs through beautiful sceneries and you get a good view on Sligo‘s landmark – Benbulbin mountain. Close to Enniskillen, the Watermill Restaurant is a great place to eat (you can also stay there for some nights).